IT Job Market will grow by over 100K net new job by the end of the year. (PRLEAP.COM) Park City, UT - https://www.e-janco.com – Janco Associates - Initially Janco reported that only 80K new jobs were added in 2018. 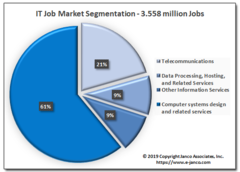 Subsequently, the BLS adjusted the number of new IT job created up by 55,600 for the last two months of 2018 bringing the total new IT jobs created to 107,100. The CEO of Janco Associates, Inc., Mr. M. Victor Janulaitis said, "Hiring for IT Professionals continues unabated. The economy is generating demand for more IT Professionals." He added, "CIOs are creating new jobs that address the increased focus on security, data privacy, Internet-based operations, and digital automation. Blockchain applications are continuing to demand more resources as seamless information flow is the prime operational objective." The CEO said, "The only dampening factor is the recent downturn in the equity markets (which seems to have turned around) and the slowdown in China's economy. However, if a trade deal is negotiated in the near-term that will not be an issue. In addition, technology mega-corporations, like Apple, Google, and Facebooks, are faced with a prospect of no to slow growth from international economic prospects and increased scrutiny due to privacy and security concerns. This could be a dampening factor on U.S. IT Job Market Growth." The CEO added, "The median salary for all IT Professionals based on our latest salary data is $93,077. That is $2,628 higher than the same time last year. Supply and demand are working in favor of qualified IT professionals. We forecast that the median salary for all IT professionals will be in the $97,000 range by the end of 2019 – a $4K increase." More information on this available on our web site https://www.e-janco.com/salary.htm. See also Janco's Blog at https://blog.e-janco.com. Janco's CEO said, "CIOs are optimistic that the economy will be one that will foster growth. Also, IT and HR recruiting managers are optimistic. They are focusing on additions to their IT staff as they begin the new year. 2019 budgets for Information Technology are up in over 80% of organizations that we have surveyed. Most companies are looking to expand IT's middle management staffs along with increasing the headcount of experienced programmers, systems designers, security experts, and mobile computing specialists."